Newest signee to Def Jam and leader of the RattPack, Logic, sat down with Rikki Martinez to discuss life as a XXL Freshman, meeting Nas, and his goals to become one of the best to ever grab a mic and rap. ... (released October 21st on Def Jam Record­ings), hailed as one the best hip-hop ... Logic chose to talk about the ... fans are moved to tears meeting Logic. Logic talks signing to Def Jam, meeting Nas & becoming the best in rap. 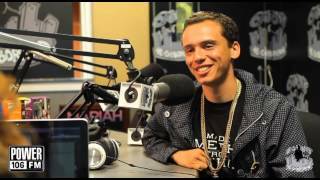 ... Logic Talks Making The XXL Freshman Cover, Rap Beginnings, Signing To Def Jam & More.